The following video resources can be helpful for individuals or in a church setting. Campolo and Claiborne have created an intensely personal dialogue about the foundations of the Christian life and voluntary simplicity. This pointed-yet hopeful video has current relevance to the yearnings of today's Christian. "Simple Living has done it again, bringing together two of the most important voices the 21st Century church has to offer. Tony Campolo and Shane Claiborne, two of my dearest friends, are modern day prophets from different generations echoing the radical message of Jesus of Nazareth -- a message still transforming lives and changing the world over 2000 years later. This is a conversation you do NOT want to miss." Tony Campolo describes affluenza as "shopping, overwork, debt and the pursuit of money," dominant issues in the North American church. Campolo suggests that simplicity is the path to abundant life. 6 sessions. Includes study guide. Money: How poor does Jesus want us to be? Abundant Life: What is it? Time: How much do I have to give away? Stuff: How much can I have? Next: What do I do come Monday morning? Does talking about money make you uncomfortable? Is our money disconnected from our faith? It is difficult to discuss our finances with each other. We make daily choices about how we spend, save, or give it away. And we generally want those choices to remain private. Particularly in church, we are uncomfortable sharing our thoughts about money. Here are ten lessons on the choices we make about money on DVD. Lesson 1. Money: How is our thinking about money influenced by society and family? Lesson 2. To Be Blessed: Is having a lot of material things a sign of God’s blessing? Lesson 3. The Call: In what ways does following Jesus change my life? Lesson 4. To Be a Steward: Does stewardship mean careful spending or taking risks? Lesson 5. Security/Idolatry: Where do we find security? Do investments deny our security in God? Lesson 6. Wealth: Enough is… do we need everything we can afford? Lesson 7. Production/Consumption: How does following Jesus affect our choices about what we eat, what we wear, what we do for recreation? Lesson 8. Poverty: What excuses do we use to protect ourselves from the suffering in the world? Lesson 9. First Fruits/Giving: Why limit tithing to 10 percent? Lesson 10. Teaching Children: How do we teach children to understand the difference between needs and desires? 55 minute DVD with study guide. One 15-minute and three 10-minute sessions, produced by Alternatives For Simple Living, explores the topic from a Christian perspective. A study guide and script are also available online. "So many of us are overwhelmed by daily demands and too many bills, not enough money, long work hours, not enough sleep, too many commitments, and not enough time for family, friends, and God. In our desperate search for 'the good life,' we seem to have forgotten what brings us joy and gives life meaning. This video helps us take a critical look at our lifestyle choices and the shape our lives have taken. It helps us realize how our obsession with buying and owning effects the Earth, other people, and the human spirit. By sharing feelings, thoughts and practical ideas from a variety of people who struggle with life in a consumer society, this video calls us toward a lifestyle that is more fulfilling and joyful." A ground breaking film about consumerism, materialism, commercialism and the antidotes. Affluenza is a ground breaking film that diagnoses a serious social disease - caused by consumerism, commercialism and rampant materialism - that is having a devastating impact on our families, communities, and the environment. We have more stuff, but less time, and our quality of life seems to be deteriorating. 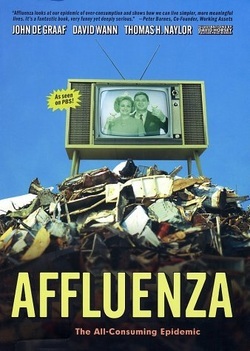 By using personal stories, expert commentary, hilarious old film clips, and "uncommercial" breaks to illuminate the nature and extent of the disease, Affluenza has appealed to widely diverse audiences: from freshmen orientation programs to consumer credit counselling, and from religious congregations to marketing classes. With the help of historians and archival film, Affluenza reveals the forces that have dramatically transformed us from a nation that prized thriftiness - with strong beliefs in "plain living and high thinking" - into the ultimate consumer society. A follow-up film, Escape From Affluenza, was also produced. The first is available in full online and a clip is available for the second (see below). Gerald Iversen of Alternatives For Simple Living presents the five Life Standards of Voluntary Simplicity and the 3-part mission of the organization. The Life Standards were originally presented in the classic "Living More with Less" by Doris Janzen Longacre.